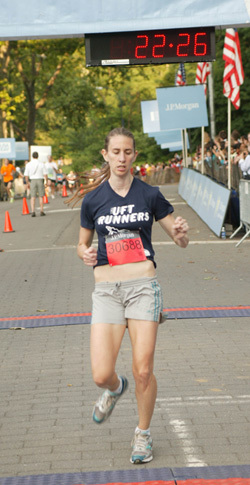 The women’s team did the UFT Runners proud when it excelled at the 2012 J.P. Morgan Corporate Challenge Race, held on June 13 and 14 in Central Park. Turning in the fastest times on the team in the 3.5-mile race were Helen Dole of MS 377 in Manhattan, who finished in 21 minutes, 40 seconds; Arien O’Connell, Beginning With Children Charter School in Brooklyn, 22:18; Colleen McGurk, PS 142 in Manhattan, 22:38; and Casey DePasquale, HS of Graphic Communication Arts in Manhattan, 23:52. The mixed team did well thanks to the efforts of Maureen Duffy of PS 142 in Manhattan and Queens educators Ricardo Bailey of Law, Government and Community Service HS, Brian Cloherty of Francis Lewis HS and Felicia Mair of Grover Cleveland HS. 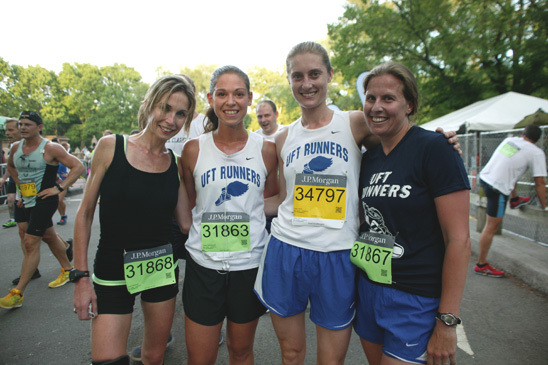 According to Mair, the chairwoman of the UFT Runners, these UFT athletes stood out in the field of 13,465 women and 15,665 men who competed. Bruce CotlerO’Connell finishes the race. See more photos in the "UFT Runners compete in Corporate Challenge" gallery.